The Chinese Electric Bike Surprise | Flickr - Photo Sharing! From a demonstration of 100 bikes in 1994 to 20M eBikes and scooters per year in China today. Even remote rural china. Even cheaper than commuting by bus in China. Much less particulate matter -> leading to Chinese push. Point source of particulates is worse than power plant far from urban center. • Tech: 2005-9: switched to brushless motors: 50->85% efficiency. Valve-regulated lead acid batteries: Energy Density up 33%, life up 35%, better cost and weight. How many would have bought a scooter if ban was not there? Most people shift to eBike from bicycles and public transit for cost. 20% would have bought a gas scooter had they had that option. 50K/yr estimated EV car sales in China. Resistance points: charging infrastructure (vs eBike – can remove battery easily, and carry inside), battery safety, cost. Public transit is not keeping up with urbanization. I saw so many E-Bikes, E-Scooters and even E-cargo trikes when I visited last fall. It was impressive, they were everywhere. I would be curious to know what you think is the major impediment to their use here in the US? A 26Kg battery can be easily removed and carried inside? I wish the graph had bicycle sales on it. Wow good timing, I just got back from Shanghai and wondered about all of these electric bikes. They really are everywhere. 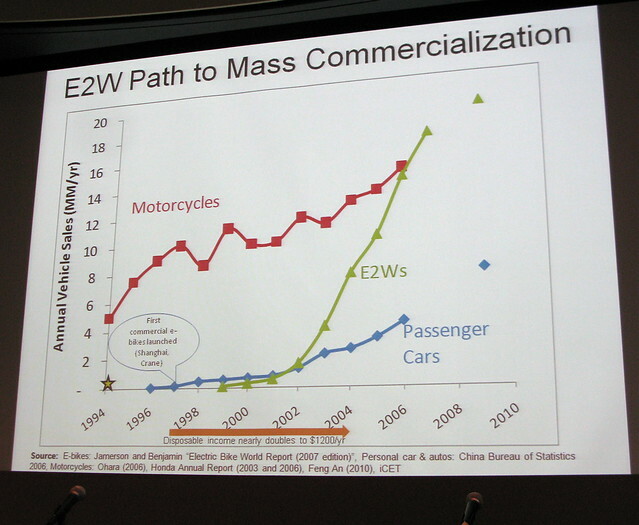 I assume E2W means "electric two-wheelers". "What kind of coal is being burned to power these 'clean machines' ?" Compare the thermodynamic efficiency of a gasoline internal combustion engine with the coal plant --> power grid --> battery combination. It turns out (not a shock to engineers) that when you don't have to carry around the apparatus for burning fuel and dissipating the 80% of the energy that gets wasted as heat, you can move a vehicle a lot more efficiently. And of course, when you don't have to make the combustion chamber portable and collision-safe, it can be more efficient too. Also, note the horsepower: 0.5 to ~1 hp. Can you build an efficient gas engine that small? Does it have enough torque to go up a hill? For electric motors, we already know the answer is yes. Great timing. No wonder there are so many electric bycicles here in Shanghai! Great solution to the pollution that's in Shanghai's air! For a while the Chinese were busy converting their excellent bikeways into roads for motor vehicles. I hope they've stopped that. Dr. Weinert's work is very important. However, some of his earlier writing strikes me as even more interesting. It was about the modularization of Chinese electric vehicles and the use of interchangeable parts. It seems as though progress on this very important engineering tool has stopped. That is most unfortunate. I have written a short essay on the subject with a very interesting photo.